Westmead Hospital registered nurse Ally Baccus praying. Ramadan has commenced today for Muslims around the world. It is a time where Muslims fast from just before dawn to sunset. During this period, Muslims pray five daily prayers at specific times. This sacred period will end on June 14, where people of the Islamic culture celebrate with festive activities. 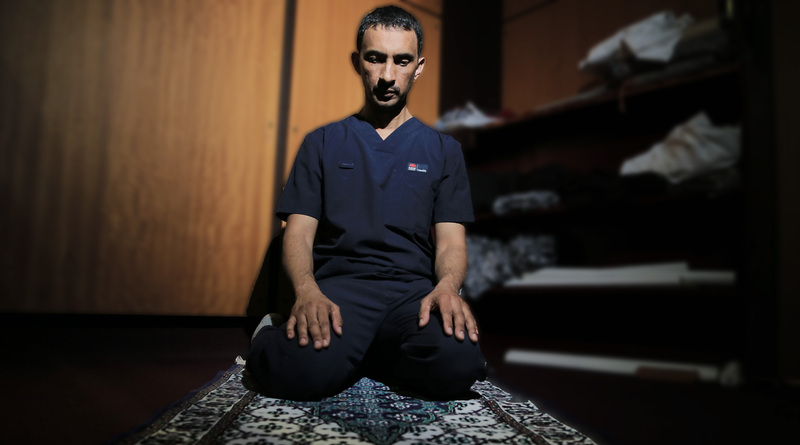 The Pulse interviewed Westmead Hospital registered nurse Ahmad Baccus who provided his personal insight into this religious period. “Ramadan is part of the Islamic faith … it is one of the five Islam pillars and it is compulsory for all Muslims,” Mr Baccus said. “Fasting helps me feel what other people and children feel when they have no food. “It was hard to fast during the daytime when I was a child because you see your friends at school eating and that’s tough. “As an adult, I understand it’s a time of recognition … where you appreciate what you have and think about others. During Ramadan the married father of two gathers together with family and friends to have Iftar to break the fast as well as attend the local mosque for prayers. “I commence fasting an hour before sunrise and break the fast at sunset each day. ← Are you our next Aboriginal health leader?